Former Tampa Bay Buccaneers coach Jon Gruden is replacing Tony Kornheiser in the “Monday Night Football” broadcast booth, ESPN reported Monday. Kornheiser decided to step down after three seasons, ESPN reported. 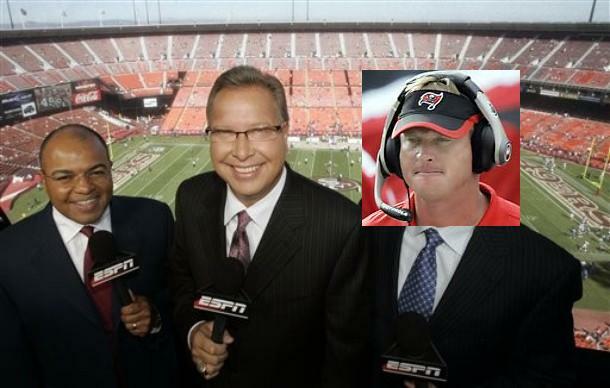 Gruden will join play-by-play man Mike Tirico and commentator Ron Jaworski. Now I don’t know how Jon Gruden talks or if he has a sense of humor, but I do know this: Tony Kornheiser needs to hold hands with Mike Wilbon and jump off a bridge. Any bridge. Preferably a high bridge. MNF has gotten better in the recent past, but before we lay congratulations on Kroheiser, there really wasn’t much to compare it to. MNF has been sub-par for several years, and Kornheiser didn’t improve it that much. Now I’m not saying Gruden will be the best thing in the world to happen to MNF, but it gets Kornheiser off, and that’s a good thing. Chances are Gruden is going to blow, but it’s worth the risk. PTI is such a great concept for a show, but I can’t effing stand Korheiser and Wilbon. Just hearing their voices makes me want to fill my ears with battery acid. You are currently browsing the archives for the Tony Kornheiser category.